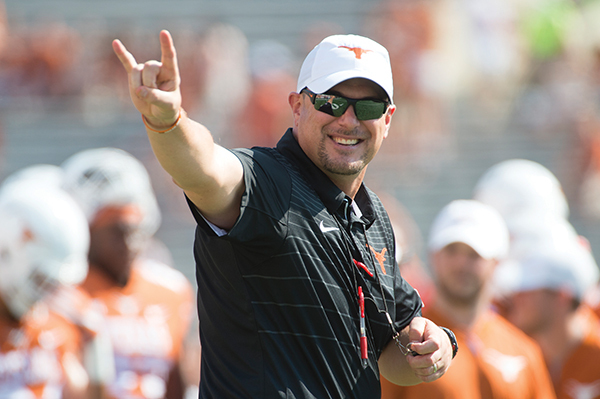 At age 42, Tom Herman ’97 has what many would call a dream job: head football coach at the University of Texas. This season is only his third as a head coach, and the casual observer might think of him as an overnight success. But the journey has been a long one. Herman’s quest began more than two decades ago, when he was an all-conference wide receiver at Cal Lutheran. Herman already had his answer. Right after getting his business administration degree, he drove 1,400 miles to Seguin, Texas, to join former Kingsmen assistant coach Bryan Marmion in starting an NCAA Division III program from scratch at Texas Lutheran University. After one season as receivers coach, Herman networked that job into a graduate assistant position at Texas under Mack Brown. From there, Herman went to Sam Houston State and Texas State, then to the next level as offensive coordinator at Rice University, where, in 2008, he helped the Owls to their first bowl victory since 1954. Three seasons as offensive coordinator at Iowa State (2009–11) led to two bowl appearances for the Hawkeyes. That caught the attention of Ohio State coach Urban Meyer, who hired Herman to be the Buckeyes’ offensive coordinator and quarterbacks coach from 2012 to 2014. In that final season, injuries forced Herman to play third-string QB Cardale Jones. Jones led Ohio State to the national championship over Oregon, and Herman won the Frank Broyles Award as the nation’s top assistant coach. The next year, Herman’s reputation as a “quarterback whisperer” landed him his first head coaching job at any level, at the University of Houston. The Cougars immediately went 13-1 in 2015, winning their first conference title in four years, and then 9-3 in 2016. So, at the end of last season, with a record of 22-4 as a head coach, Herman was on the A-list for top colleges looking for a new coach. He opted for familiarity with Texas, signing a five-year contract reportedly worth $5 million a year. Definitely successful. Definitely not overnight. “I’ve moved my wife and family six times in the last 11 years, if that’s any indication of the instability as far as a family life and home life can be in this job,” Herman said. “In 2006, 11 years ago, I was a [Division] I-AA coach. I’ve coached at a lot of different levels: I went from Division III receivers coach to Division I graduate assistant to I-AA assistant to I-AA coordinator to Group of Five coordinator to Power Five coordinator to top 10 coordinator to Group of Five head coach and now Power Five head coach. Herman said his NCAA Division III experience at Cal Lutheran had elements he wishes he could implement at Texas. Now considered one of football’s best brains, Herman was known for his sense of fun as a student. “Initially, I would say goofy,” Squires said. “Let me rephrase that. Let me say charismatic. He was a fun guy to be around, always had a smile on his face, a prankster a little bit. He was just fun and I know a lot of our team gravitated toward him because he was that way. He even used to be an announcer at the basketball games in the old gym and he’d get everybody going” — Herman was known to jump onto the scorer’s table and dance during timeouts — “and next thing you know, you’d see him at a dance, or at least I would hear of him at these dances, doing the same kinds of things. So he could get people to gravitate toward him because he was kind of an electric personality that way. Just as evident were Herman’s determination and energy. As a player, he endured 13 knee operations and four shoulder surgeries. In addition to public address announcing for basketball, volleyball and baseball, he also did an internship for a sports talk radio show in Los Angeles and worked as an NFL highlight coordinator for Fox Sports. Another of Herman’s odd jobs was working at a Subway restaurant. He recently told Fox it didn’t last very long. The owner showed up unexpectedly, found Herman with pastrami dangling from his lips and told him to get out and not come back. When he maneuvered his way into a graduate assistant job the very next year at Texas (where he slept in the locker room), he hedged his bets by making sure he also earned his master’s degree in education. Good thing, too: In his very first game with the Longhorns, he forced the team to use a timeout by misreading a play chart. The journey has taken him back to Texas, where he’s running the whole show and trying to make it his own, balancing the desire to win quickly with the desire to win for years to come. The most thrilling early highlight in Herman’s first season turned out to be a loss — a 27-24 double-overtime defeat to No. 4 USC that impressed many people. Texas had a No. 23 preseason ranking, but Herman had downplayed it. Sure enough, the Longhorns started out with a 51-41 loss to Maryland. Despite the spotlight his new job brings, Herman wants to maintain the humility of his early days.